The Convergent Procedure is a new and innovative treatment option for patients with chronic or difficult to treat atrial fibrillation (AF). The Convergent Procedure is innovative because it is the first AF treatment which truly integrates a surgical and a catheter approach into a single procedure. 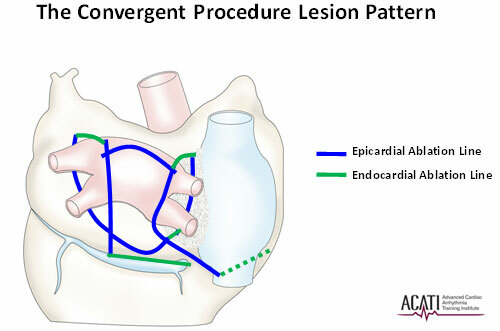 During the convergent procedure, the cardiac surgeon and the electrophysiologist work side by side to identify the source of AF and create a pattern of scar on the heart, shown below, to treat these problems. The entire procedure is performed with miniature cameras and instruments and with small catheters and electrodes. The co-disciplinary treatment of AF extends beyond the treatment room. A team of arrhythmia experts develop a unique treatment plan for each individual patient based upon clinical criteria. A specialized nurse coordinator navigates patients through their treatment plan to completion. The Convergent Procedure is not just a procedure to treat AF, it is a commitment our team makes to the patient to eliminate AF and regain a normal heart rhythm again. Copyright © 2009 Dr. Andy Kiser. The contents of this Web site, such as text, graphics, images, and video are for informational purposes only and are not intended to be a substitute for professional medical advice, diagnosis or treatment. Always seek the advice of your physician or other qualified health provider with regard to a medical condition.